Friendly Suggestion: If I'm about to conduct a trade that will hurt my reputation with someone, I'd love to be notified before it's accepted by the Exchange. There's nothing more frustrating than finding some artifacts/weapons/electronics, then getting screwed on my rep because I forgot to check the Conflicts screen before selling them and a new war just popped up 1 turn ago. You are TOTALLY right about that! Needs to updated! I have created a new Issue Report that asks for an Icon to be added that warns the Captain about this type of problem. It'd be awesome if, after completing a mission, you weren't sent off into space automatically. I'd like to be redirected to the planet menu so I can make repairs, buy water, etc. I've had a few cases where I've completed a mission and then, after having to avoid ships when trying to land, end up snagging an unavoidable battle with a pirate and get blown up. 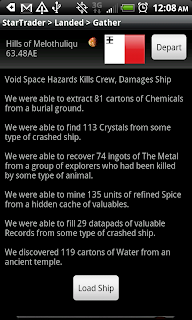 Also, if there were a notification that you were about to leave resources behind which you harvested/discovered on a planet, it would also be really helpful. Sometimes I end up leaving stuff behind because of an accidental button push. Being able to see the price of ship upgrades right away would save a lot of menu-navigating time. Either that or greying/making the button red if you *can* get the upgrade but just lack the cash. But yeah, this game is great--I've been hooked on it for weeks! Thanks. The Aliens. They just mean death everytime (which is permanent on Hard mode). Is there no way to survive or avoid these encounters!? They don't just appear in deep space. One ambushed me outside the DeValtos starting planet!